Yamagata Film Critic Workshop 1st Day – The Copper Village – ドキュ山LIVE! One does not watch The Copper Village, a look into the traditional and laborious process of copper mining and smelting in the mountain village of Okharbot in Western Nepal, without being reminded of recent films produced under the Sensory Ethnography Laboratory (SEL), whose works combine the patience and keen eye of anthropological research with a strong sense of the aesthetics of cinema. One of their recent works, Stephanie Spray and Pacho Velez’s Manakamana, was also shot in Nepal. It documented various groups of people traveling to an ancient temple via a cable car — a journey covered each time in a single shot. Despite the film’s languorous pace at two hours, the world inside the cable car becomes animated by the conversations of the passengers, local and foreign alike (with some animals), emerging from the dark conveyor and released into the vast expanse of the mountains. Focusing more on the journey than the destination, it presents a facet of a cultural tourism that does not rely on plain exoticism. Filmmakers Dipesh Kharel and Frode Storaas also take us on a journey in The Copper Village by following Ujir, one of the village’s elders and a pioneer foreman, relying on him as a veritable source of information on the process of mining and smelting copper, a traditional practice that is on the brink of extinction in the face of globalization. Copper mining is not only of economic importance to the villagers; it is also an important cultural heritage, as is emphasized by the elders’ laments over the present generation’s inability to pass on this tradition. In the open forum that followed the screening of the film, Kharel noted that his documentary is like a recreation and rediscovering of the process, “making it known” once again. Thus, he and Storaas take the time to bring us into the dark depths of the mines to obtain the copper ore for the tedious process of smelting. 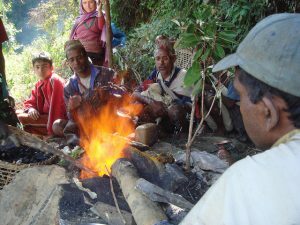 Kharel and Storaas expand their scope by covering the other elements of the process from the making of a bellows (from goat’s skin) and the production of charcoal to the construction of the coal-fired oven, in itself a work of skillful masonry. The filmmakers also introduce us to the various “actors” that take part in the entire process, a kind of reflection of the old caste system. The film, after all, is a celebration of hard work that culminates in the final extraction of the prized copper, which is not even bigger than Ujir’s hand; but their lack of a weighing scale to accurately measure its monetary worth does not diminish its value. However, The Copper Village is more informational than cinematic, owing its orientation mainly to the directors’ anthropological discipline. The camerawork, with its constant zooming in and out and panning movements during the villagers’ conversations and the steps of the process, is a visual metaphor of the researcher’s eyes and ears; it exudes the inquisitiveness and comprehensiveness of research work, not wanting to miss any aspect of the subject matter. Kharel and Storaas function more as researchers in the film than directors, employing very little variation in the film’s visual design and editing structure, although such variation could have added a certain tension and immediacy to the subject matter.